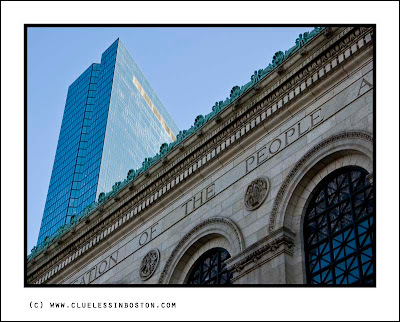 A different view of the Boston Public Library and the Hancock Tower. Beautiful contrast! I like how the library has blue details too, echoing the tower (and the sky). I like it! I agree the contrast just jumps out at you! I also loved the contrast in this shot and the angle.Wonderful picture! What a great image. Love the angle. A very good view from an unusual angle. Very interesting contrast and lovely pale blue palette! We made it a point to visit the library (about 17 years ago now!) - for it's great art. They were in the middle of a renovation then so we saw only a bit of the inside. Must go back. Great angle on the shot.